Perusing stacks of old cooking magazines, I picked up the July 2006 issue of Gourmet noticing Zucchini Ginger Cupcakes was dog-eared, perfect for Test Kitchen Tuesday. 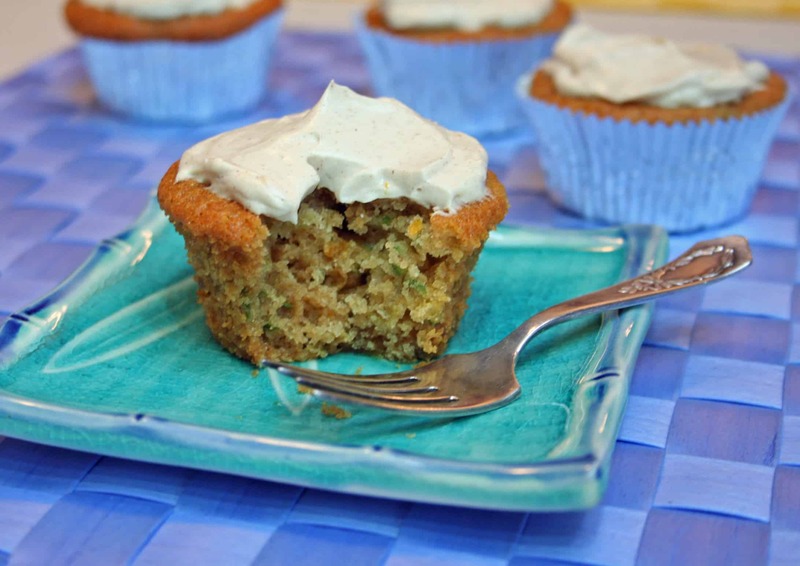 Ginger and orange are well-matched, the zucchini is sure to keep the crumb moist, these are a must-try. My plan is to convert it to a gluten-free recipe I can take to showers or potlucks, so wish me luck! I hope you join me in this delicious adventure! 2. Leave a comment describing your experience, opinion, adjustments, or suggestions. ♥ If you focus on altering it to economize, choose healthier ingredients, make it gluten-free/allergy sensitive, embellish for entertaining, or incorporate into batch/once-a-month cooking, please mention that too. 4. If you are especially proud of your creation, send a photo to [email protected], or include a link to your site with your comment. Put oven rack in middle position and preheat oven to 350°F. Line muffin cups with liners. Pulse crystallized ginger in food processor until finely ground, then add flour, ground ginger, cinnamon, zest, salt, baking soda, and baking powder and pulse until combined. Whisk together zucchini, oil, honey, eggs and vanilla in a medium bowl, then stir in flour mixture until just combined. Divide batter among muffin cups and bake until golden and a wooden pick or skewer inserted in center of a cupcake comes out clean, 20 to 24 minutes. Cool in pan on rack 10 minutes. Remove cupcakes from pan and cool completely, 1 hour. Beat together frosting ingredients with an electric mixer at high-speed until combined well and fluffy, 3 to 5 minutes. Frost tops of cooled cupcakes. These look yummy! I’m still getting tons of zucchini from our neighbors too. Thank you so much for getting me started on this delicious track! Wow, love the ginger in these! 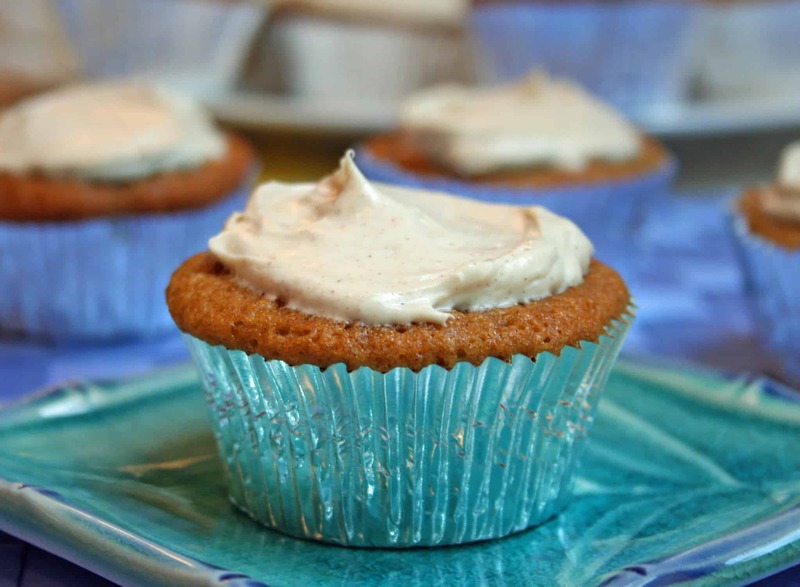 Moist, lightly spiced, a real treat! I wondered if I should post a new recipe with the changes I made to make it gluten-free, but I decided to stay with the program and keep it in the comments. If you think it warrants a new post, just let me know. 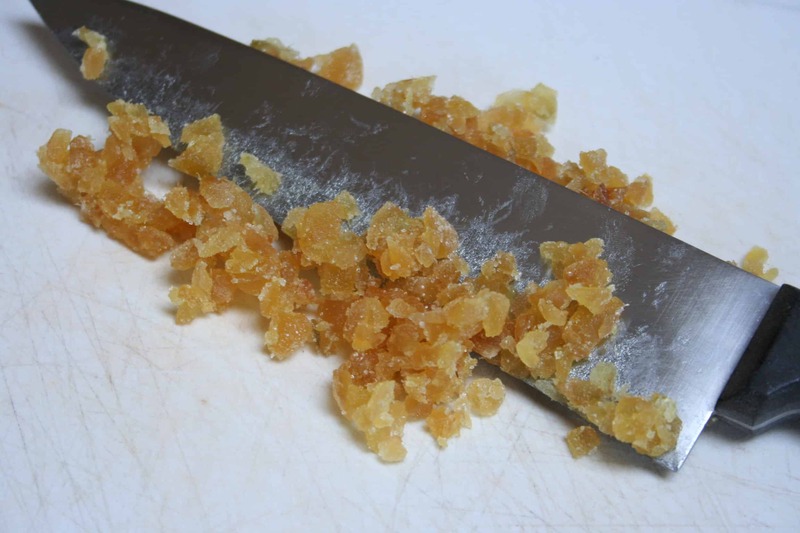 1. chopped the ginger by hand for a course chop (photo above) instead of using a food processor–I wanted distinguished bites of ginger. 2. mixed the flour and dry ingredients together, then incorporated the chopped ginger into the flour before adding the wet ingredients. 1. The batter is pretty thin and doesn’t rise much, so fill the paper cups 3/4 full. 2. Next time I will omit the cinnamon and ginger from the frosting because it made it a little gritty and doesn’t need the extra spice anyway. So glad you got to experience it before its end. It is the only magazine I have ever read the letter from the editor, faithfully. Ruth Reichl had a way of connecting with food that made me feel we were sharing a cup of coffee together as she introduced each issue–unpretentious, like food always held a story. Thanks for stopping by, it was good to find your blog too! What a great idea. I’m sitting this one out. Way too many desserts lately. Although… hmm, maybe I could make it healthier. Great recipe.